That bird is kinda cute. A lot of the games I do for this feature are abysmal failures. Sure, games like Columns and Super Thunder Blade just haven’t aged well, but were generally decent in their day. Most of the other games I’ve done are and have always been terrible games. A lot fall under the “so bad they’re good” category, like Shaq-Fu would. But sometimes I play a game that is so bad it physically hurts you to play it. I did that this week with Dark Castle. The graphics of Dark Castle are really strange. They almost look like digitized cartoons. I can’t really fault the game for this because maybe it was trying to be artistic or something. I can’t use that excuse for the sound though. In the first door on the right when you begin the game the bats in the level sound like annoying birds trying to mate with other annoying birds. In the second door there’s some eye thing that was voiced by Curly from the Three Stooges and makes a sound similar to “nyn nynynynya” for the entirety of its life. They also appear in the room on the far left, but we’ll get to that in a minute. Your character is also an annoying jerk that should shut up. All he does is grunt when you get hurt, which is a pretty good incentive to exceed at playing this game. The background music is some generic classical music that sounds a lot like the music from the original Columns. The resulting cacophony makes me want to rip out my ear drums and strangle myself with them. Seems awfully similar doesn’t it. I think that’s really all that needs to be said about that. The balls bounce instead of rolling though, so I guess that makes it acceptable. By the way, the Donkey Kong wannabe grunts too. So what about the gameplay? Dear God, the gameplay. I think I would have a much easier time trying to explain what they managed to do correctly. In fact, I’m going to do that: they did nothing correctly. They fucked up every imaginable aspect of the gameplay. You can jump, sometimes, but you can only jump a fixed distance in the direction in which you are facing. You can’t jump straight up and you can’t decide mid-jump to turn around. The jump is pretty lame anyway. Going up stairs is pretty standard, but half the time it doesn’t seem to work very well, or you’ll notice your character is waving his hands in the air as if he just doesn’t care. Well that’s because to attack you throw rocks, but instead of just shooting straight ahead or being able to manually point in the direction you want to throw in you have to select an arm height. Pressing up raises your arm while pressing down lowers it. This takes a long time, and most of the time an enemy hits you long before you can aim. Sometimes pressing down makes you crouch, but I really haven’t figured out that mechanic yet. You can’t do any of this on stairs, except sometimes when it raises your arm, as I mentioned earlier. Sometimes when you die you don’t start at the start of the level, but rather it sends you to purgatory, I guess. Do you see that paragraph there? It’s pretty long eh? Those are only the problems I can remember off the top of my head. This game is the worst that I’ve ever played and worst of all it’s painfully hard so I can’t even beat a level in it. Usually I try to play most of the game for these features, but I can’t get any further, and frankly I don’t care. It’s practically unplayable and not even amusingly so; it’s just broken. What’s worse is that apparently other versions of the game are pretty good, specifically the PC version. It’s a shame that a game with so much potential turned out to be so bad. 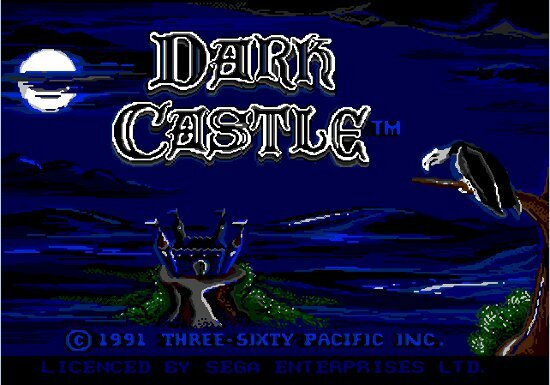 The PC version of Dark Castle is one of the first games I ever played. It was really fun and I was horribly disappointed years later when I played this Genesis version. A very bad game indeed. Dark Castle related to Dark Tower or Dark Crystal? I *love* Dark Castle. 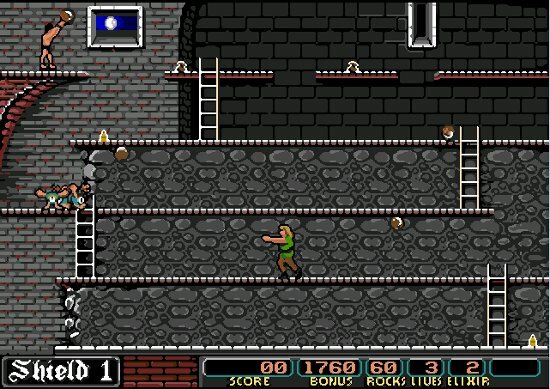 Like Alex, the computer version (in my case Macintosh) was one of my first games. Loved the strategy of it, screen to screen, with the little bits of action timing that you’d have to master. And Super Thunder Blade was never a good game. Ever. Even the Master System port is much better, preserving the top down and from behind perspectives (where the Genesis version just tried to be cutting edge by being entirely from behind and showing just how bad the system could not scale! ).